Female Occurs throughout England south of a line between the Wash and the Severn estuary with many coastal records; in the west country it is almost entirely coastal, and the largest concentration of records is around the Thames estuary including Kent, Essex and London. Further north there are a few scattered records to Durham and Cumbria and, with the exception of an old north coastal record, there are none from Wales (Luff 1998). Quoted by Luff 2007 as scarce, and included on our Watford list from a single specimen found under a birch log on open dry grassland in Cassiobury park during April 2009. The regular pifalling we do in apparently suitable situations locally (including the site of our only record) would suggest the species is very infrequent in our area. This is a little surprising to us and we have wondered why it had not turned up sooner; during the 1980's we have found them regularly around Uxbridge and Denham to the south of us, it was never common but specimens occured regularly on Uxbridge moor and Harefield place golf course. Typical habitat is open situations on dry chalky or sandy soil; wasteground, parks, gardens etc where the adults occur among leaves and moss etc (Lindroth) or under debris. Adults occur until September(Luff quotes June-September) and are autumn breeders. 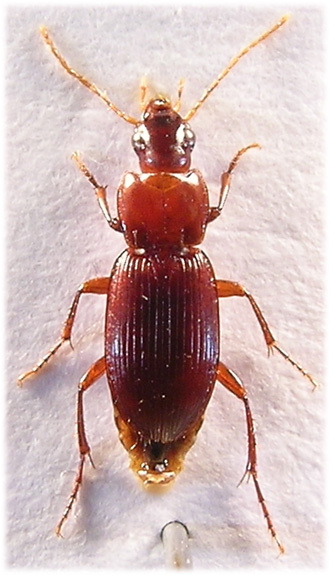 5.5-8mm (Lindroth) A narrow and elongate ground beetle, dorsally flat and entirely piceous brown to light brown or with the head and/or elytra darker. Distinctive by virtue of the produced pronotal anterior margin. Head shiny with very fine and sparse puncturation which is just visible at X20, area of vertex opposite centre of pronotal anterior margin densely microsculptured - this is apparently a stridulatory mechanism (Lindroth). Eyes entire and moderately convex, temples constricted to a curved neck. Two setiferous punctures beside each eye. 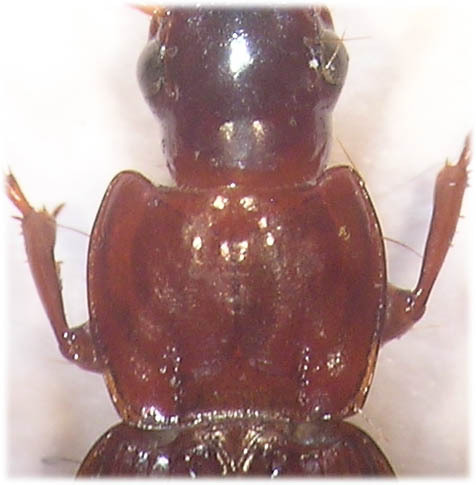 Antennae and palps entirely pale, last segment of maxillary palps cylindrical, as long as penultimate. Antennae densely pubescent from fourth segment. Mandibles long, curved towards apex and sharp. Pronotum slightly transverse and broadest just in front of middle, lateral margin strongly bordered and evenly curved to protruding and rounded front angles. Anterior margin produced medially. Basal margin incurved and strongly bordered, hind angles obtuse and rounded. Basal fovea single, elongate and narrow. Puncturation sparse and very fine, most ovbious in front of basal margin. Scutellum impunctate. Elytra somewhat parallel sided, evenly rounded to apex. Basal striae sharply angled over shoulder and extending in to form a short scutellary striae. Each with seven entire, well impressed and impunctate striae, eight stria with a series of setiferous punctures from base to apex, these are wider spaced medially. Third interstice with three punctures which are generally attached to the second or third striae. Interstices with dense microsculpture. Epipleur not crossed. Legs long and slender (overall Platyderus resembles a Calathus and, like species of that genus, it can run rapidly) Protibiae deeply notched inside before apex. Claws smooth. Male with three dilated protarsal segments.